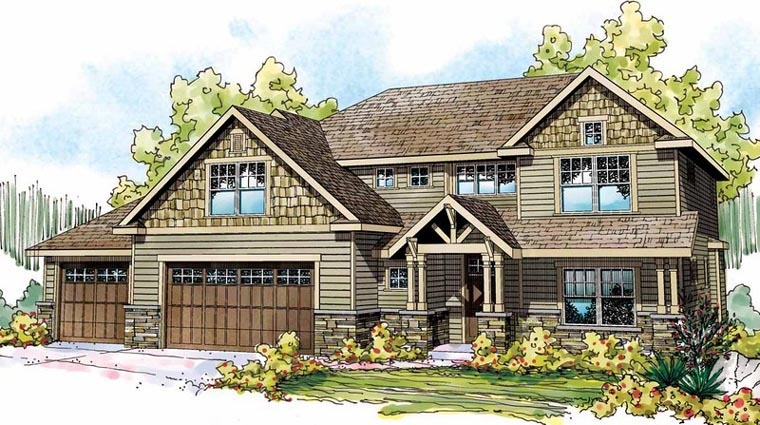 Craftsman home plans. 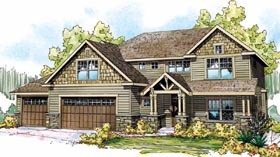 Nostalgic shake-textured siding fronts the garage gable of this Craftsman cottage update. The dining room sits at the heart of the large interconnected gathering space at the rear. A family room with fireplace is to the right, and a generously sized kitchen is to the left. Three bedrooms and a bonus room are upstairs, and a guest suite is below. Question: You have done a wonderful job with this plan. It is layed out very efficiently. If you did the bonus area, which I presume is over the garage, what would happen to the roof line? Do the pictures posted represent the home with the bonus area? What are the dimensions of the bonus area? Would you use attic trusses and have slanted walls on each side or would it be like all of the other rooms? Thanks! Answer: Thank you for your interest in plan number 59487. The bonus room is included with the plans. The dimensions for the bonus room are 13’ x 23’-2” and is created with attic trusses. The portion of the bonus room that is in front of the utility room has sloped ceiling, but the rest of the room has a flat ceiling that matches the rest of the second floor. 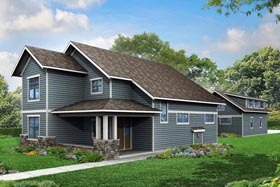 The rendering does show the bonus room above the garage. Please let us know if you have any other questions about this design.